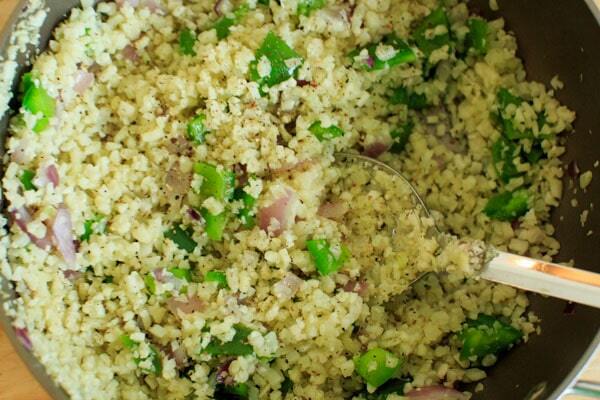 Riced cauliflower with green peppers and spices. This low-carb, healthy side dish is completely customizable and will be ready in 15 minutes! Cauliflower: vegetable of the year for 2015 (or 2014, depending on your source). Who decides this stuff? And yes, I realize it’s 2016 or later, depending on when you’re reading this. I’m known to be a little late sometimes. The point is that the internet has blown up with cauliflower recipes over the last couple years, and cauliflower “rice” is one of those. 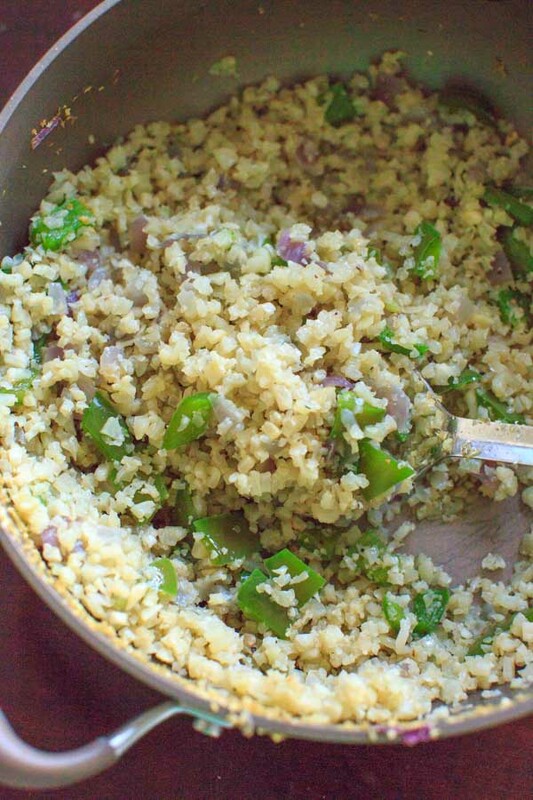 I don’t need to tell you how to make cauliflower rice. You literally just put a head of cauliflower in a food processor and pulse until you get little rice sized pieces. It does help if you cut the cauliflower first to fit it in, but jokes aside, it is very easy to make. 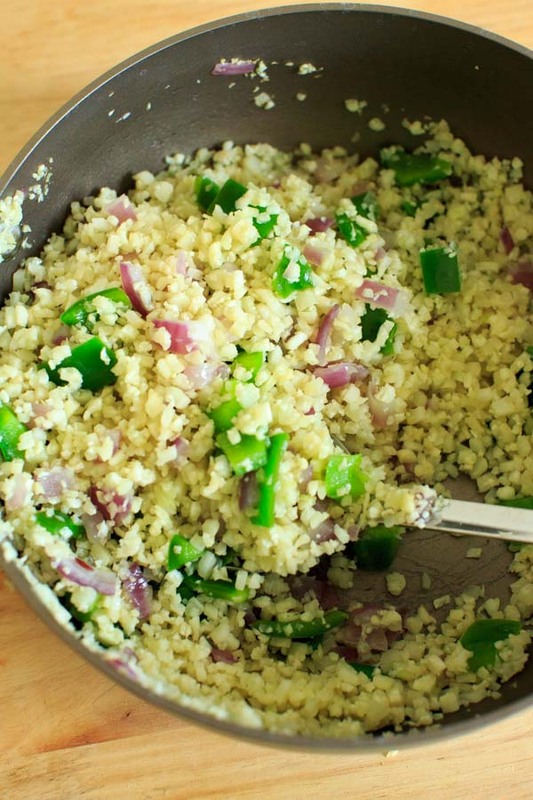 It’s actually pretty amazing the ways you can substitute cauliflower to make dishes healthier. Aside from the pizza crust mentioned above, I’ve seen it used in place of potatoes, “alfredo” type sauces, or even seafood with my skinny bang bang version. Obviously I’m not claiming it tastes exactly like any of the things it’s being substituted for, but it gives you the general feel. Actually, I personally think cauliflower is one of those things that doesn’t taste like a whole lot until you put something in it. So the key to this side dish is seasoning! There are probably a million ways to make riced cauliflower, so feel free to get creative and throw other veggies, spices, or whatever in there. I kept my recipe fairly plain this time, but I’m sure I will experiment more in the future. You can apparently eat cauliflower rice raw also, but I have not tried it. Personally I thought it helped to cook a bit to give the flavors a chance to meld together, and also I prefer it hot (as most rice dishes would be). A little bit of oil (I always lean towards coconut oil, and no it does not make it taste like coconut), garlic, onion, green pepper and your choice of seasoning (I used cumin, salt/pepper) and that’s all it takes! Oh and the cauliflower of course. Can’t forget that. Also if you happen to come across the pre-riced cauliflower bags, that eliminates the biggest step of the recipe! No judgment here. I like pre-cut, pre-riced, pre-anything if it makes my life easier. Trader Joe’s for the win. In a large pot, add the oil and cook over medium heat. After a minute, add the garlic, onion, and bell pepper to the oil and saute for 2-3 minutes. Remove from heat, add cumin (or other seasoning) and salt and pepper. 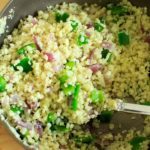 * I cooked towards the longer end of this range (10 minutes), but since cauliflower rice can be eaten raw with no cooking, this can vary by personal preference. I was dubious that anything could replace rice with a good hot curry. But this recipe to replace the basmati rice we always have was amazing and left me feeling like I had eaten a healthy curry! I did however add a teaspoon for chicken stock powder along with a little water whilst it cooked, the flavours were amazing. I will be making this again. So glad to hear you liked it Lyree!